Welcome to the official V-Day Bakersfield 2019 resource site. 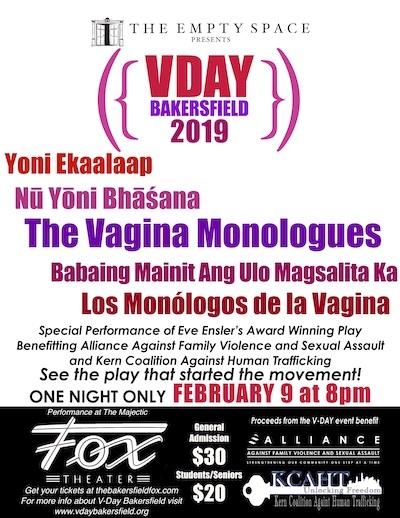 To date V-Day Bakersfield has raised over $70,000 for local nonprofits working to end violence against women and girls and has sent 10% of our proceeds over the years to the V-Day Spotlight Campaign helping women all over the world! Help make this year, our Sweet 16, even better as we once again raise money and awareness for Alliance Against Family Violence and Sexual Assault and Kern Coalition Against Human Trafficking as well as sending a small donation to The V-Day Spotlight Campaign. This year should be our biggest yet as we perform at The Majestic Fox Theater on February 9. Auditions are Saturday, January 5 from 10am-1pm and Sunday, January 6 from 11am -2pm at Red Crane Portraits at 1412 17th Street, Suite E in the Haberfelde Building. See the Events menu item for more details. Please visit last year's site. Please visit our site from 2017. Please visit our site from 2016. Please visit our site from 2015. Please visit our site from 2014. See Eve Ensler’s award winning play with proceeds benefitting Alliance Against Family Violence and Sexual Assault and Kern Coalition Against Human Trafficking. Support our sweet 16 at The Majestic Fox Theater on February 9. Please use this sponsor letter and form to ask for sponsors and donations for our event. Are you sharing this information with a business or friend? Please update the letter to make it more personal if you have a personal connection to the business you are asking. Are you one of our actor/activists and are unsure where to start? Use the sheet to brainstorm different people to contact to help this important cause. The deadline for inclusion in the program is February 19 at the latest. Print flyers for sponsors or to invite guests.